Things have been a bit crazy around here lately. We had to move all our downstairs furniture out so we could have the floors sanded and varnished, a job that was well overdue following our recent plumbing problems. On top of that we had to move out to my parents' house (half an hour away) for two nights while it was done. We arrived back home three days later to find dust EVERYWHERE even though we'd covered everything with cling wrap and drop sheets. Cling wrap keeps sawdust out really well BTW. Worse still, there were gaps between the floorboards that looked terrible. I rang the sanders and they said they would fill the gaps and do another coat of varnish the next day. OMG more sanding and another coat of varnish when we'd just moved back home and I'd spent the entire day cleaning up sawdust. 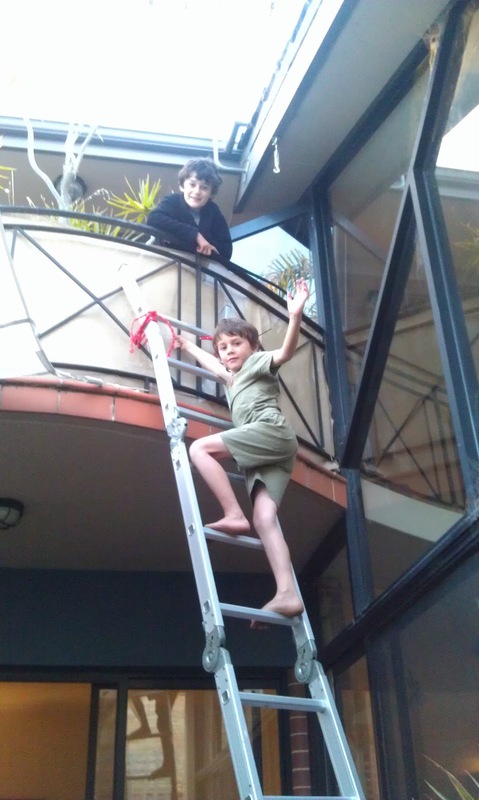 I couldn't face moving out of the house again, so I devised a plan involving a ladder up to our balcony so we could climb up to bed! Needless to say, the boys thought this was the best idea ever! 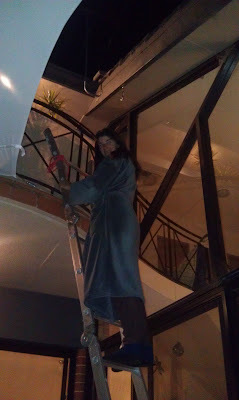 The ladder actually worked fantastically well, although it was a bit precarious climbing over the balcony railing, especially in the dark! 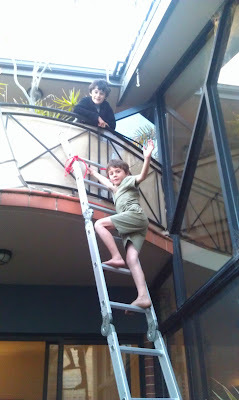 I also lost count of the number of times I told the boys they were not allowed to go up/down it right now. Later the next day we were able to walk on the floors again and, after a busy weekend, we are almost back to normal. He was slightly puzzled by the teary-eyed, very squeezy bear hug he received in response. Now, there's just one more Serious Talk I need to have...no more of this now the floors have been done!! Oh no I wish I hadn't seen this: we're having our floors sanded too, and after plastering the walls when a whole day was spent clearing up dust. I shall be most strest, no doubt ;-) But the ladder was a great idea and the floor looks fab! Oh dear :( Just remember the dust gets in everything. It even went into (and covered) our upstairs bedrooms through cracks under closed doors. I got a massive roll of cling wrap and covered the entire kitchen to stop it going in the cupboards and that worked well (apart from where the sanders removed it). Proper preparation takes ages but is really worth it. Good luck and don't be too strest! Coming out of lurkdom here. Love your blog. 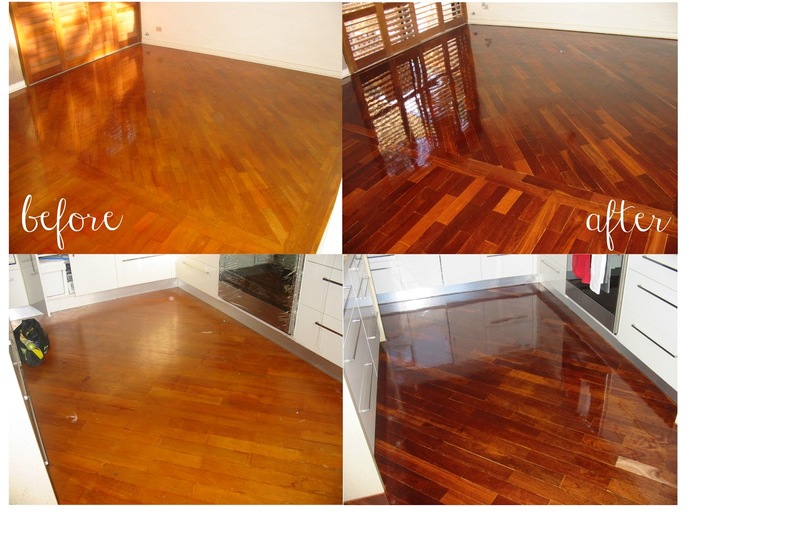 Your floors reminded me of when we were renovating our Queenslander, steps were removed and I ever so lady-like climbed down the ladder each morning in my little business skirt and top, heels in hand to catch the bus to my "other" life in the CBD. Thank god those days are behind me. The floors look fabulous by the way! !